At 32-years-old and married with one child, Jeremy Collins heard the voice that whispers to us all – settle down, work harder, buy a bigger house and a better car… grow up. But Jeremy Collins heard another voice as well, and the other voice told him to gather his climbing gear and set out in the four cardinal directions – west, east, south, north – “to climb something spectacular and fill my sketchbooks with the experiences, the stories, the visions.” He listened to the second voice, and Drawn: The Art of Ascent is the product of the adventures that ensued. He traveled west to climb a new line up Middle Cathedral Peak in Yosemite Valley. He traveled east to Xinjiang, China, where he and friends climb the granite domes along the Irtysh River. He traveled south to climb Venezuela’s sandstone mesas, and he traveled north into Canada, to climb The Phoenix, a 2,600-foot wall in the Yukon’s Vampire Spires. In addition to art and climbing, Collins has long dabbled in filmmaking. 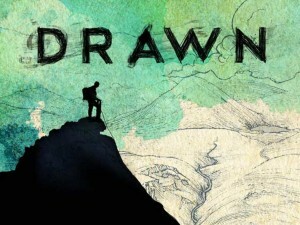 In 2009, he made a short film entitled “Border Country,” about two friends who died in an avalanche while climbing in China, and the journeys he recounts in Drawn were done, in part, to honor those friends. Prior to its incarnation as a book, Drawn was a film finalist at the 2014 Banff Film and Book Festival, no doubt a moving experience. His facility with art and storytelling transmute Collins’ personal story into one with universal appeal. Drawn is a book for climbers, sure, but it also will be loved by anyone with an appreciation for mixed media storytelling, visual journaling, and art of the natural world. is a book for climbers and anyone with an appreciation for mixed media storytelling, visual journaling, and art of the natural world.